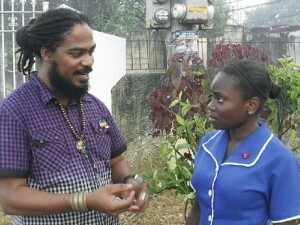 SUDENE JOHNSON, a 17-year-old lower sixth-form student of Immaculate Conception High School and resident of Gregory Park in St Catherine, is the 2011 winner of the Elder Thomas Scholarship, valued at $30,000. It is part of the educational programme implemented by the Forward Step Foundation, as it seeks to rekindle the community plagued by many ills. Miguel ‘Steppa’ Williams and Sudene Johnson, 2011 winner of the Elder Thomas Scholarship awarded by foundation. “I think Forward Step Foundation is doing a good job in developing the community and creating a bond between the community and the police,” Johnson, an aspiring journalist, told The Gleaner. Forward Step, the brainchild of Miguel ‘Steppa’ Williams, focuses on five core areas of service delivery and enlightenment – creative arts, entrepreneurship, education, healthy lifestyle, and environment/safety and security. “There was a gap in the community. We recognise that there are a lot of churches, but there wasn’t outreach in the community,” Steppa, a part-time lecturer in the Institute of Caribbean Studies at the University of the West Indies, Mona, explained. Under its educational banner, young people are encouraged to submit articles for publication and read its newsletter Gregory Park Talk, issued throughout the community. Classes are also held under the guidance of ‘Jah Mike’ in Christian Pen, as an extension of the programme. Notably, every February, activities in observance of Black History Month take centre stage and plans are already under way, for the 2012 celebrations. “We’ve had people like Mutabaruka in the past, and Yasus Afari should be coming in to give the Black History Lecture next year. We have a Black History Expo, when we used to have some of the service providers to come in as well,” Steppa, also a renowned dub poet/performer, added. A major concern, however, is the occasional flare up of violence which oftentimes cripples social and economic activities in the oldest community in Portmore. So, in addition to an annual children’s treat, a stage show is held to demonstrate the non-partisan and non-religious path it has charted, as it embarks on a mission to bring about unity. “It’s a non-violent, non-slackness stage show, and within that stage show, we have competitions that give people a chance to win prizes,” notes Steppa. And, welder Carl Riley, who has been living in the community for 25 years, welcomes the intervention. “Forward Step a build the community. More time, when you have the war vibes a dem man bring the stage show and bring the people together and ting and we love to see that in the community,” Riley shared. To bolster the grip on the situation, Fitzroy Williams, one of its own, now serving as detective inspector at the Inspectorate Branch in the Jamaica Constabulary Force, has been mandated to co-ordinate safety and security efforts. “We are going to coordinate from the CSS (Community Safety and Security) point. They would, from time to time, stage workshops where citizens would be advised about what to look out for, such as signs of crime and awareness,” the Gregory Park All-Age and Kingston College past student outlined. 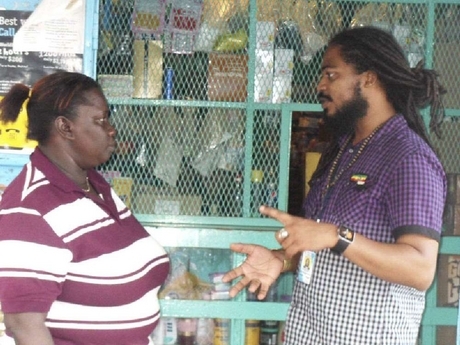 Besides, as it devises strategies to lessen acts of crime and violence and stimulate the creation of employment, the foundation’s events and food-security co-ordinator, 34-year-old Andrew ‘Boboshanti’ Holgate, through his Dumpling Shop, has been the model entrepreneur. “Boboshanti shows practical entrepreneurship working, which is integral to our doings. He also facilitates our headquarters. We use his shop as a place where citizens can collect forms for the National Youth Service, HEART Trust/NTA, the Programme of Advancement Through Health and Education, and even our application forms for the scholarship,” Steppa explains. Juliet Holgate-Dixon, treasurer of the Forward Step Foundation, and Miguel ‘Steppa’ Williams discuss the organisation’s financial affairs. He highlights agriculture and skills training as features of the foundation’s multi-faceted approach to community integration and upliftment. Thirty-one year-old Collin Myers, a HEART-certified mason, is the skills training co-ordinator. “For now, he provides assistance. If a little house wants to fix in the community, him provide that kinda assistance. The long-term vision is we would have skills training programme and we would bring in HEART, as well as other projects and he would spearhead that,” Steppa says. In the same way, it is members like treasurer Juliet Holgate-Dixon, a business operator, who has been extending a helping hand to needy children even before assuming her current post, who keeps the highly cultural-based organisation moving. “When we were growing in this community, adults used to look out for us. So now, I look out for other people’s children. Sometimes there are children without lunch money, I would give them money; sometimes a boy’s hair needs to cut, I would send him to the barber,” Holgate-Dixon, a St Hugh’s High School graduate, related. As Steppa indicates, while the foundation had its genesis in Gregory Park, its impact has been far-reaching. “We have a radio programme ‘Word Soundz’ aired on Sun City 104.9 FM every Wednesday from 10 p.m. to 2 a.m. It goes across the entire Portmore and a couple parishes, and through this medium, we use creative arts and edutainment to empower,” Steppa informs. In fact, the foundation’s work is further enhanced with input from professionals like Emprezz Mullings, public relations and entertainment advisor; Dr Jahlani Niaah, research/culture advisor; and Dr Kadamawe KnIfe, social entrepreneur advisor.